I am spending day two here in Bangkok continuing with working with WASC. Today’s workshop is training to be a chair for a WASC committee. I will probably not lead a visit in the near future, but I am getting a good perspective of the visit. One of my takeaways for the day is to read thoroughly, the Focus on Learning (2014 edition). The other big takeaway is analysis and getting insight, not just describing what is occurring should be the focus of the report. The workshop was conducted by all of the leaders of WASC international accreditation. Marilyn George, Harlen Lyso, David Ottaviano and others were present to help out. How can the tools of ACS WASC help schools? 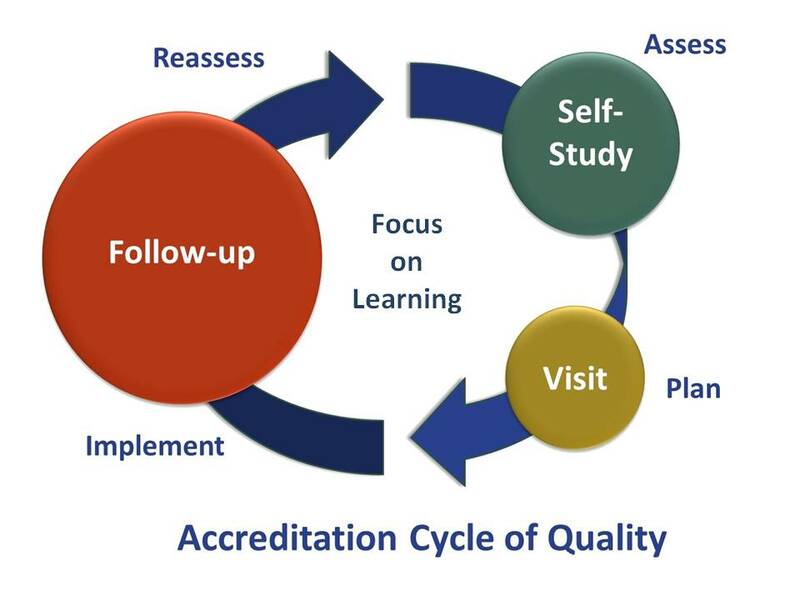 The diagram below is the basic cycle of the school accreditation process. I am putting the seven accreditation principles into my own words to help me understand them. Is the school living its mission? Are all students achieving to their potential? Are faculty analyzing different types of student achievement data? Is the schoolwide action plan prioritized and based on evidence? Does the school continue to try to improve transparently in between visits? Is the school listening to all stakeholders? In our discussion, the health/safety and child protection issues are internationally applicable. So in those countries that do not have the same standards as the USA, WASC mandates the safety standards of the USA, not of the host country. The new website allows schools to upload interim reports and starting this year schools should be doing this. They offer many webinars on a variety of topics. Schools must submit reports to WASC at least six weeks prior to the visit all of the reports sent at the same time. From over 1,000 visits, there were only 4 appeals. This occurs only with a “withholding” or “probation” judgement. You cannot appeal a regular six-year cycle. The appeal will entail another visit with an experienced, neutral “WASC-ateer”. Please use the proper protocols so WASC can defend the appeal. Do not regurgitate the self study and do not write a 60-page report. We want succinct analytics and insightful comments. Committee members can pre-write reports based on documentation and then just confirm with observations. We want to only write what was backed up with evidence, and triangulate sources. If you are chair, contact the school as early as possible to get clarification of the documentation and check major errors earlier. 90% of all pedophiles do not have a police record. Screening is not enough and there needs to be structures in school to cover this. Always read the last accreditation report, read the entire web site, and all documentation sent to WASC before going to the visit. Know the Focus on Learning manual and regard it as your Bible. Chapter I: School Profile This tells our story and can be used for many purposes. The data needs to have demographic, outcome/achievement, and perception. This data needs to be looked at by everyone. Need to include the mission/vision and learner outcomes. Are they global, interdisciplinary, measurable, and in kid-friendly language. Chapter II: Progress Report What has been done since the last visit. Chapter IV: Summary of Findings for Each Criteria The visiting committee will look at the analysis, strengths, and critical areas for follow-up. How much evidence is enough? It seems like schools usually have too much data because they are afraid of not having enough. The most important aspects are making sure data is driving teaching decisions and show having an impact on student learning.